Sometimes when an app is updated, it’s an overhaul that gives it a new feature set that makes it a major contender in its category. For apps that already own the a top spot in their field, or is at least the most notable name, all an update really has to do is work and it will help maintain the app’s title. Skype is definitely in the latter of those two scenarios, as its name is essentially synonymous with video chat. Its recent Android app update is more about expanding territory than features, as it optimizes the app’s UI for the growing tablet market. The new look uses a two column style that keeps navigation options on the left and information displayed on the right. The smartphone version looks the same, but it wasn’t in as desperate need of change as its tablet equivalent. Skype 3.0 makes the most of the extra real estate on tablets and bypasses the home screen in favor for your contacts. If you’re longing for that home screen, it’s still present on the smartphone app. You’ll also get a nice look at the splash screen before launch, as the app is a little sluggish at start up. Here’s the problem with that new tablet UI design: it only works in landscape mode on smaller tablets like the Nexus 7. No one likes to be forced to use their tablet in one way, and worse, many Android tablets like the Nexus 7 have cameras mounted in different places, sometimes making a landscape orientation uncomfortable or awkward. Unless you’re a talented contortionist, you’re going to be getting at least a little neck ache trying to orientate yourself properly. With the increasing popularity of the 7-inch tablet, this seems like a significant misstep in functionality. While smartphone Skype users won’t get a fresh coat of paint, they will benefit from some improvements under the hood. Skype 3.0’s overall theme is all about improving call quality. A new audio codec known as SILK has been added, which is designed specifically with the human voice in mind. Working with the available internet connection, the codec will optimize quality as best possible. It’s not something you’ll see, but it’s definitely something you’ll notice during calls. In the video chat market, this is a defining feature. Also included in the app is the ability to log in using your Microsoft account. This marks the official moment of phasing out Microsoft Windows Live Messanger, which will officially be retired by the first quarter of 2013. Skype will become the official chat option for Microsoft, so consider this feature the final nail in Windows Live Messanger’s coffin. Until Skype fixes that forced landscape option on smaller tablets, it’s hard to suggest the update to those users. Everyone else, go ahead. You’ll notice a crisper quality in your calls. 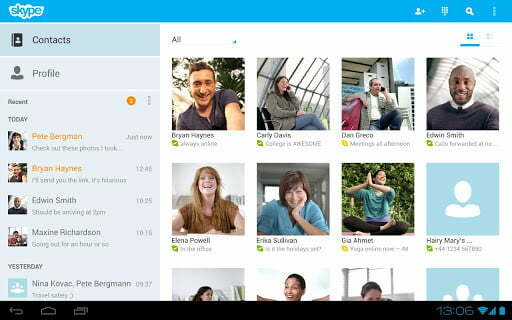 The Skype Android app is available for free in the Google Play Store.